Question: Are Champions Born or Made? Answer: Champions are born, because it is a matter of destiny. Many Champions have come out from the National Stadium…most of all our greats passed through there. And we still feel their presence despite their absence. What makes a Champion is not because he/she is successful in their various careers. It is because they will never accept not trying. Champions realize that whatever they engage in is their life’s work, hence they must give it their absolute and uttermost best, and if they have to die to achieve their dream, they will. They have the ability to do what others aren’t willing or are afraid to consider. 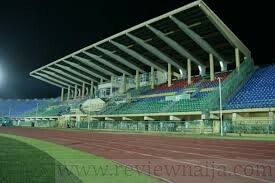 The National Stadium located at Surulere is packed with Champions; people who realize that life as a whole is an inevitable struggle, especially in Nigeria, hence their mindset is set for War and their minds are battle ready. Every single day matters, every minute and every second. Albeit the facilities are few/virtually non-existent, these Champions still find a way. · Your fitness/sporting goal can be achieved if you know your way around. · There are people willing to train you for a small fee, howbeit you’ve gotta have your own personal knowledge, combine what you know with what they know, and pray to God to connect you to the right people, lest you might encounter a blood sucking vampire or have to deal with mediocrity and incompetence. · Champions exist and are readily available to advise you, but they are few, like 20% of the stadium population. · A lot of incompetence and mediocrity mainly due to poverty and lack of proper education. · Extremely terrible facilities. I need not go further here. Only the National Institute of Sports Gym is manageable. · Sometimes the management create poor policies and play politics, which in turn ends up affecting athletes e.g. locking up training facilities (But the Champions find a way to get in). The major problem with a lot of folks in Nigeria is Poverty and greed. A lot of Nigerians are poor and there isn’t any joy in poverty. Due to Poverty, many folks here are frustrated and act under tension. And when they get power, greed sets in, because their poverty hasn’t provided them with proper education on character and human development. 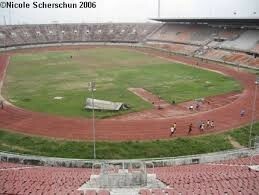 Poverty has caused some athletes to turn parts of the stadium to their bedrooms, since they can’t afford accommodation. For the Champions and true fighters, the National Stadium is both joyful and painful. Joyful because of the love we have for the sports. Painful because we struggle everyday to achieve due to the lack of coaching and adequate training facilities. To conclude, the key for all of mankind is for individuals to focus on their strengths. What is your strength? You’ve got to find out what your strength is, so you can focus on it, because the world is just too competitive. Don’t waste time with something you’re not the best at. At the same time, we must understand that Poverty prevents strength from manifesting, therefore our aim and goal is to be rich and famous (famous so we can create impact). When we achieve these two things, we will then demand privatization of the National Stadium from the Federal Government. And if they refuse, we will build our own. This place holds so much memories for me: I learnt to ride a bike here, I understood what jogging to keep fit was running round this place, I made friends here. It might not be what it used to be anymore, but it hold sentimental value for what it used to represent to me.